← How to batch convert rtf to gif? How to upload my photos safely? After taking those wonderful photos with your digital camera, you will likely want to share them with friends and family. In order to do this, the pictures must be uploaded from your PC to your website. However, once uploading the pictures, you maybe worry that someone will use your pictures to do something illegal or maliciously damage your image. In a word, you want to add limits of authority to your pictures then how should you do? I recommend a way to you, hoping it will be helpful. 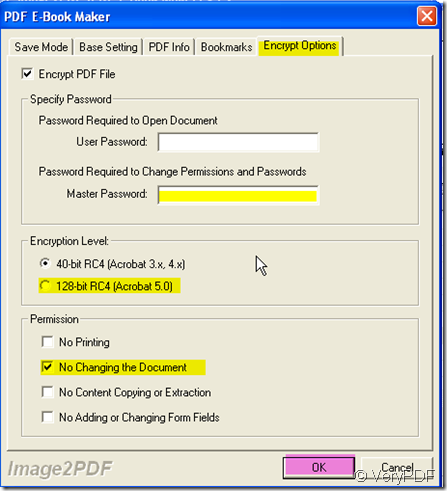 You can combine all your images into a PDF file then set a password for this PDF file. Tell the password to your friends and family, then others can not open this file. I convert the images to PDF file by a software. Then I will show you how to finish the converting. 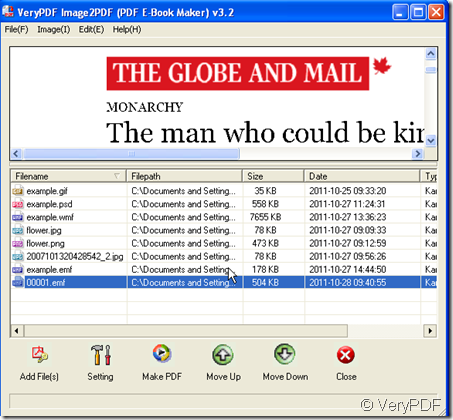 Download the software here:http://www.verypdf.com/tif2pdf/tif2pdf.htm#dl It is Image2PDF v3.2 whose another name is PDF E-Book Maker. Even if you do not upload your images, you can make them to E-Book and store it to your mobile phone then you also can show them to your friends around you. When you enter the downloading homepage, please save “img2pdf.exe” package , unzip it and let it run in your computer. Then you can convert the images to your PDF files. Add your images to this converter. I take some pictures for example for illustrating. Please click “Add Files”, then choose your folder in the newly bounced dialog box. If the format of your images is same, please choose it at the “Files of type”.If the formats are different, please choose “All Files”. Click “Open”, all the files will be added to Image2PDF. When you finish adding, all the files details will be shown in the blanks,such as file name, filepath ,file size and so on, you do not worry you will mistaken them.Just simply click the file, it will be shown in the interface screen. Then you can set a password for your PDF file at “Setting”menu option. At “Encrypt Option”,please set the password at “Master Password”, you also can choose the safety level.Say you can choose the “12-bit RC4”. Meanwhile, please choose “No changing the document”,then it will be absolutely safe. I guess no once can change it but you. The password has been set , then click the “Make PDF” file to finish the converting process. At the “save as”dialog box, name it and save the PDF file. It takes a few seconds, then you will find the PDF file in your appointed folder. How could I get a grayscale pcx through converting pdf to pcx in PDF To Image Converter? How to convert image to PDF in batch? 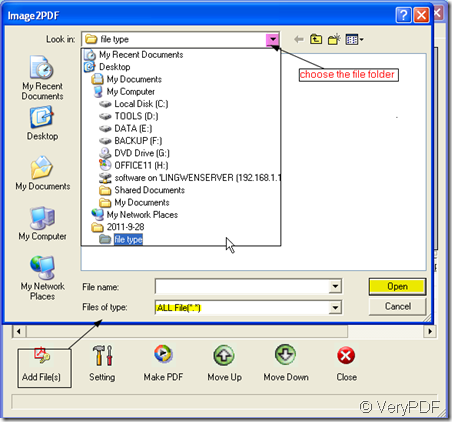 How to convert PDF to searchable PDF file?